Our Multi Activity Camps provide a high quality experience to all children who participate. We offer children from 4 to 12 years the opportunity to discover their hidden talents in a fun and enjoyable atmosphere whilst maintaining an environment of sportsmanship, fair play, friendship and kindness. Junior Campers are aged 4 to 6 years, whilst Seniors are aged 7 to 12 years. Camp runs from 9.30am to 3.00pm daily with additional Day Care options also on offer. With a wide range of sports and games on offer, each child will find something they truly engage with, focussing on skills development, both social and sporting. Our Camp Leaders are fully qualified professionals with a range of interests, experience and skills to draw on. Sports – Football, Hockey, Basketball, Badminton, Tennis, Swimming, Volleyball, Gymnastics, Tag Rugby, Obstacle Courses, Kwik Cricket, Rounders, Softball and Athletics. We focus on skills development in these sports, playing both drills and matches and provide junior versions of these sports for our younger campers. Games – Dodgeball, Capture the Flag, Pony Express, Multi Sport, Problem Solving, Treasure Hunts, Scavenger Hunts, Quizzes, Parachute Games and Bingo. Arts & Crafts – During inclement weather we will offer arts and crafts sessions for all our Campers, using a different theme each week, ensuring that there is no repetition for children who are with us more than one week at a time. Roly Poly Polar Bear! 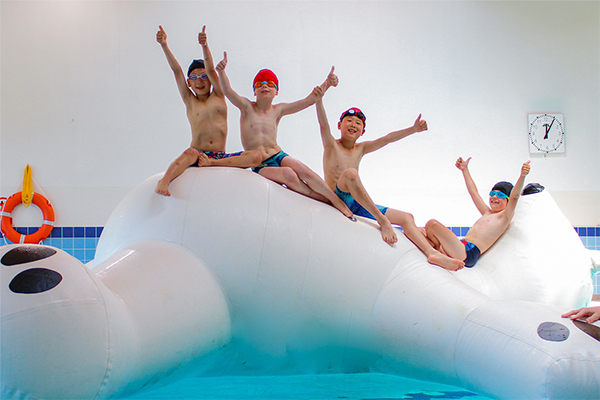 – A valued member of our team, our inflatable polar bear stands at a whopping 4 metres high! A huge attraction during our fun swims at each camp. Lunchtime and Day Care – We offer a hot lunch as part of the Camp package, all food is nutritious and freshly prepared by our in house Chef, Mark Ryan and his team. A mid-morning snack and juice is followed by a hot meal, tasty dessert and squash drink at lunchtime. Don’t fret if your child is a picky eater or has food allergies, our Chef can accommodate specific needs. Please make us aware of all food related conditions and allergies. Day Care is available from 8:15am to 9:30am and from 3:00pm to 5:00pm and can be booked on a daily or weekly basis, either for the morning or afternoon, or both. Please contact us for pricing and to confirm your booking. Our Swim Intensive Camps are focused weeks aimed at improving swimming ability, confidence and stroke technique, enabling all participants to maximise their swimming potential. The fact that there are five consecutive daily lessons boosts learning and confidence within the pool at a rapid pace, and the benefits have been hugely successful. Swim intensive courses are ideal for those who are struggling with a certain stroke or technique, and are in need of some additional instruction. The Camps are a great way to keep your child swimming throughout the holidays and are suited to all ages from 4 upwards and abilities. Some levels may be combined if booking numbers are low. Swim Intensive Camps run daily from 3:15 – 4:00pm Monday to Friday. Please note that where a swim camp runs during a bank holiday week, the cost is reduced. To proceed with booking Camp Activities, please use the ‘Enrol Here’ button below.